As followers of Śrīla Prabhupāda, we have been taught that service to the instructions of the guru (vāṇī) are given more importance than service to the form of the guru (vapuḥ). All of Śrīla Prabhupāda’s followers know this. However, sometimes according to personal taste or circumstance, we may focus more on one or the other. This year in Vṛndāvana on Śrīla Prabhupāda’s disappearance day, there was an occasion to see this. In the morning during the ceremony in honor of His Divine Grace, various disciples of his were called upon to glorify their eternal spiritual master and share some remembrance of him with the rest of us. Many told personal stories of some pastime of his they personally witnessed or had the great fortune to be a part of. It was noted that some devotees tended to give special emphasis to his instructions or tried to explain their experience with him with reference to śāstra. These were classified as vāṇī presentations. Others tended to focus on some interaction he had with him, how he dealt with them, how they were encouraged by him, and so forth. These were classified as vapuḥ presentations. During the morning recitations, which went on up to the abhiṣeka, there were 29 speakers total, and all were disciples of Śrīla Prabhupāda. For each speaker, which type of presentation each gave was noted (vāṇī or vapuḥ), and each speaker’s gender, sannyāsa status and guru status were also recorded. These results were then compared with one another using a statistical procedure called a Chi-Square test, which was used to determine if there was any significant difference between various groups as to whether they gave vāṇī or vapuḥ presentations. Here are the contingency tables with expected values generated for performing the Chi-Square tests. So, what can we infer from this? The results are limited to this group of devotees. The results cannot be generalized to any others outside of this group. That is because the sample was neither random nor representative of the full body of Śrīla Prabhupāda’s disciples extant today. Moreover, just because someone gave a presentation at this time and which happened to be classified as vapuḥ does not mean that he (or she) generally gives more emphasis to Śrīla Prabhupāda’s vapuḥ than his vāṇī. 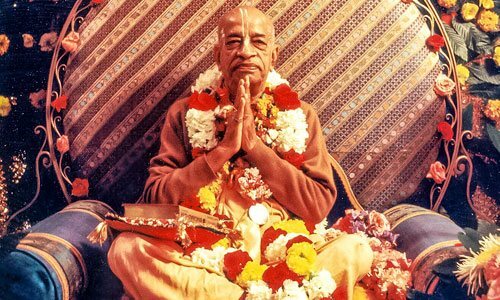 Some who gave presentations that got classified as vapuḥ are well known for their attachment to Śrīla Prabhupāda’s vāṇī. Additionally, how these presentations were classified is also very subjective. Someone else recording their observations might classify the presentations differently, possibly very differently. In this case, the criteria for being classified as vāṇī was if the presentation gave special emphasis to Śrīla Prabhupāda’s instructions or if the presentation was śāstric (quoted śāstra, linked a remembrance to śāstra). And even if the exact same criteria were used by another person, it is almost certain there will be some difference in how each speaker is classified. So, given these constraints on what we might infer from the statistical procedure, the results are nonetheless interesting. and non-gurus (male only) and gurus. Between men and women, according to the Chi Square test performed, there was strong evidence of a difference between men and women with men being 14 times as likely to give a vāṇī presentation than women. There were 21 men and 8 women, and two-thirds of the men (14 out of 21) gave vāṇī presentations whereas only one of the women gave a vāṇī presentation. The rest of the women were classified as having given vapuḥ presentations. The same Chi Square test was performed between non-sannyāsī males and sannyāsīs and also between non-guru males and gurus, and no significant difference was found between either sets of groups. There was not enough of a difference between them to believe that there is an association between being a member of one group or another and their choice to give a vāṇī or vapuḥ presentation. The only significant difference was between men overall and women. Being a member of the male group is associated with a preference to give vāṇī presentations, and being associated with the female group is associated with a preference to give vapuḥ presentations. Again, this result is not generalizable to the body of Śrīla Prabhupāda’s disciples, what to speak of the body of all devotees. But it may serve as a starting point for further scientific exploration, as is often the case with non-random, non-representative samples in many scientific fields. Where statistical tests such as the Chi Square test can be useful is in determining whether there is enough of a difference between one group and another on some characteristic that is not attributable to random or accidental causes. In this case, if four or five of the women had given vāṇī presentations instead, even though the proportion of women giving presentations would still have been less than that of the men, the difference would not have been significant according to the Chi Square test. And then we would have concluded that (at least in this group) that there is no reason to believe there is a preference for giving vāṇī presentations or vapuḥ presentations on account of being a man or a woman. But in this case there was a difference. The gap between the proportion of men and the proportion of women that chose to give a vāṇī presentation was wide enough for the Chi Square test to detect it. Why that gap is there can be the subject of further, more rigorous scientific and śāstric research. Our initial test nevertheless pointed us in this direction, and to that end it can sometimes be useful even for Kṛṣṇa conscious purposes. For more information about the Chi Square test, see this Wikipedia article and also the use of the Chi Square test in Microsoft Excel.